How well do you know your neighbor? When is the last time you received a hand written letter in the mail? Who are you to the outside world and who are you behind closed doors? At a time when genuine human contact in our everyday lives is diminishing, Habitat explores the connections we weave between one another and the spaces we inhabit. Six relative strangers encounter one another, some are friendly, others shy. They reveal themselves gradually to one another and to the audience with the help of their circus disciplines – trapeze, aerial silks, slack rope, juggling, German Wheel, and acrobatics. Their level of communication with one another varies from the most tender of love letters to the most perfunctory to-do list. In the end they find what links all of us together, the desire to connect with one another, and the courage to do so. Who says a garbage can is trash? Who says sweeping up is a chore? 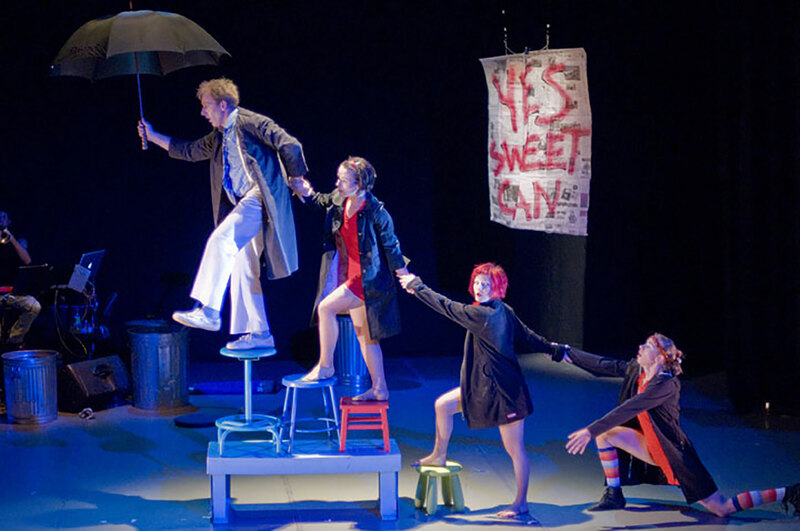 Sweet Can’s second production, Yes Sweet Can explores the theme of resourcefulness and instills new life into old ideas, creating a world in which anything can happen. Throughout the show the performers journey toward expanded perspectives with the help of their circus apparatus–aerial silks, acrobatics, slack rope, and hula hoops, all propelled by the infectious musical concoctions of EO–a one-man orchestra. These journeys reveal the magic in the mundane, which is accessible to everyone, by using the ordinary objects that make up their world. Take a trip through a surreal storm where gravity is challenged, garbage cans dance, and the metaphor is made real. Candid offers an honest look at the limitations and possibilities of our imagination. Using everyday objects like a broom, a chair, dinner plates, hula hoops, and simply their bodies, Sweet Can manages to convert everyday life into a breathtaking circus. We experience flexibility in thought and body by expanding our perspectives; imagine if you will, dancing on fabric in mid-air, standing on one hand, and catching anything that comes your way! 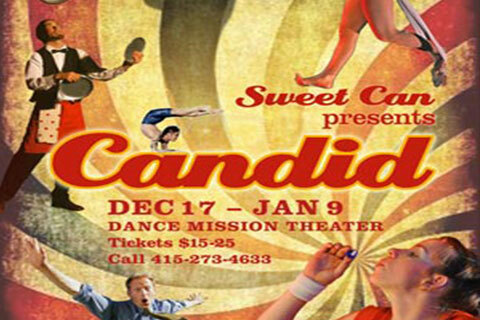 Catch Candid for a magical journey that transforms life into art.